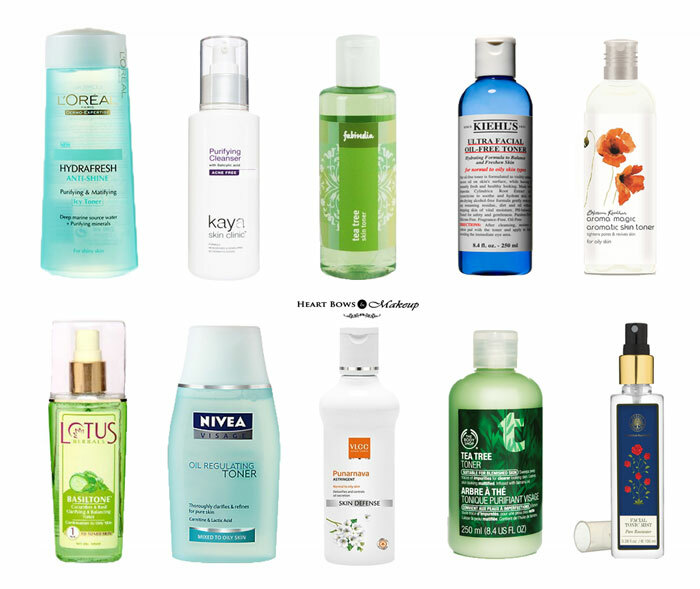 Home » Best Of The Best » Best Toner For Oily & Acne Prone Skin in India: Our Top 10! What is that one step in your CTM routine that you miss more often than not? I bet it is toning, which is an important step not be missed especially for those with oily skin. Toning helps remove any residue left behind despite cleansing the face, removes oil and helps restore the PH balance of the skin. It also helps to minimize open pores and prevents breakouts. Needless to say, toning is an integral part of any skin care routine which we dare not avoid. With summers right around the corner, even the driest of skin starts leaning towards the oilier side and with so many options available in the market, we help choose the one best suited to your needs and budget. So here are the Top 10 Best Toner In India For Oily & Acne Prone Skin including both affordable and high end options! The Hydrafresh Toner from L’Oréal is enhanced with powerful hydrating agents, to ensure that the skin is hydrated enough yet free of oil for a considerable period of time. It also cleanses the impurities from the skin even when there are some leftover after washing your face. With its skin tightening properties, this is one of the best toners for large pores and oily skin. It has a pleasing aroma which allures the senses and gives a refreshing feel to the face as well. Best suited for combination to oily skin. This amazing toner by Lotus has a blend of cucumber and basil, both of which work outstandingly well on oily skin. The cucumber extracts cleanse the skin with a cooling effect and also hydrates it without making it oily. The basil is an influential cleansing agent, antifungal, antiseptic and natural toner which reduces the pores making the skin soft and supple. 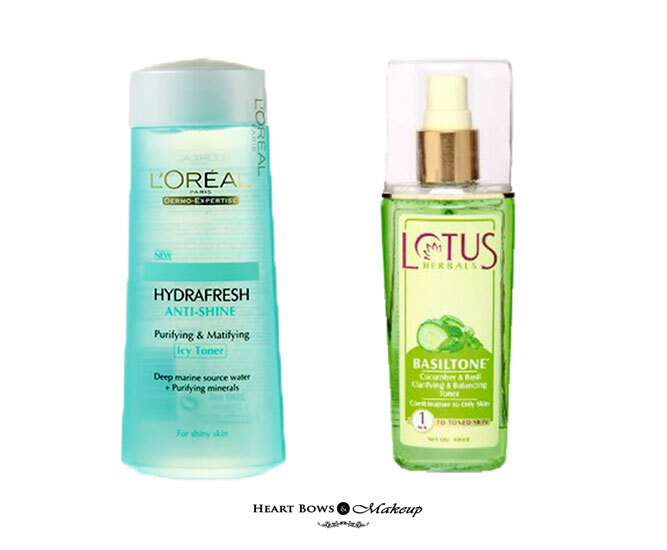 The Lotus toner also helps maintain the natural PH balance of the skin . A good budget friendly option and perfectly designed for combination to oily skin, this toner truly lives up to its bargain. With Carnitine and Lactic Acid, Nivea Visage Toner helps regulate sebum production while thoroughly clarifying the skin without drying it out. It keeps the oily skin shine free for a significant amount of time while cleansing the dirt and impurities. It has a certain hydrating feel which doesn’t strip away the natural oils due to the presence of glycerin and neither does it itch or irritate the skin. Specially designed for oily skin, the toner is dermatologically approved. This is one of the best affordable and drugstore toners for oily skin in the market. An alcohol free toner that keeps the skin oil free for around 4-5hours and is a great option when you’re on a budget. It has various ingredients that help you deal with the oily, acne prone skin and also reduces the pores to a noticeable extent. The skin feels cool, smooth and hydrated without any sensation of irritation. It also works great on whiteheads but its claim of working on blemishes isn’t true. Another great budget toner for oily skin and large pores in India. This is probably not the best astringent for oily skin available in the market but it sure is a great option for those wanting an affordable toner. It tones and removes oil effectively however if you have sensitive skin then its not the best choice for you as it can sting the skin a bit. It has a very herbal scent and is perfect for usage in summers. Aroma Magic is a great herbal brand with effective products at an affordable price tag. 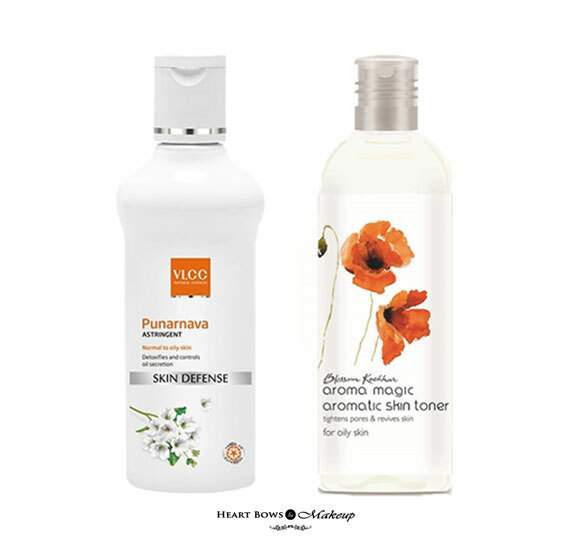 Their alcohol and paraben free toner for oily skin helps soothe irritated skin while effectively removing dirt and oil. It is also hydrating and perfect for combination to oily skin. For the price, another great affordable toner for combination-oily skin in India. 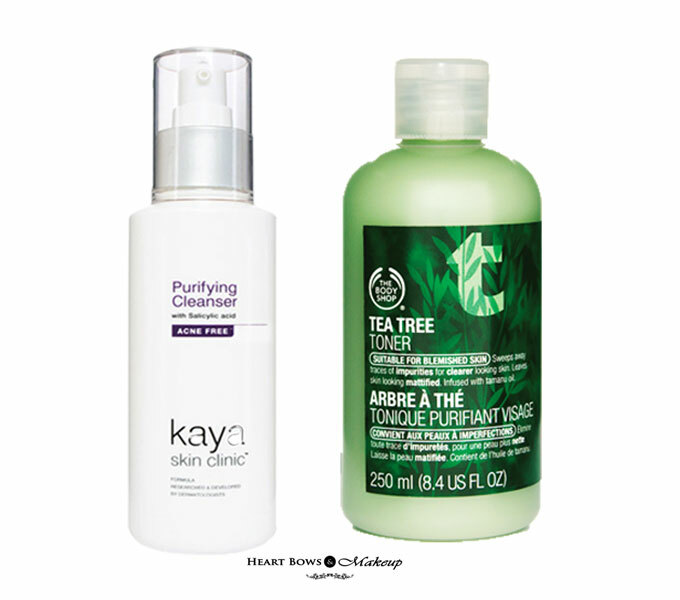 This purifying toner by Kaya is a very gentle product which works excellently on oily and acne prone skin. Having salicylic acid as its key ingredient, it controls the acne and the Mandelic Acid gently exfoliates and helps unclog pores. This is an awesome toner for large and open pores as it helps in tightening them resulting in smoother and healthy looking skin. The toner has a light, refreshing fragrance and removes every trace of dirt. The product is non-comedogenic and dermatologically tested. Considered to be the best toner for oily skin, the TBS Tea Tree Toner is the ultimate favorite for beauty experts all over the world. With its refreshing, anti-bacterial benefits and anti-fungal features, the toner thoroughly works on oily skin making it smoother and clearer. It helps a lot with the stubborn breakouts and the tiny zits due to excess oil secretion. The other benefits include the reduction of pores and elimination of blackheads with a magical difference. It sure is one of the best toners in India for acne prone skin. Another phenomenal product from an Ayurvedic brand is the FE Pure Rosewater Toner which works like a miracle on oily skin. It has 100% steam distilled rosewater without any harmful chemicals that tones and revives the skin. It has cooling, soothing and moisturizing properties with a divine aroma of fresh roses. The natural chemical free toner for combi-oily skin reduces the pores to a large and also boosts hydration. Priced a little on the higher side but it is sure worth the indulgence. Kiehls is one of our favorite brands when it comes to effective skincare products though the prices are a bit steep. Kiehls has some great toners in their kitty and we had a hard time choosing just one. Though we are huge fans of their Calendula toner which works really well for oily skin but their Ultra Facial Oil Toner takes the cake. 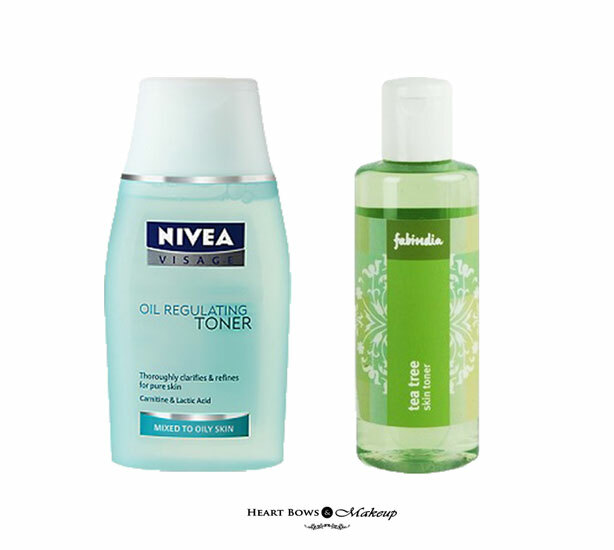 This toner effectively reduces the oil visible on the skin’s surface while adequately hydrating it. This alcohol free toner removes dirt and grime and makes the skin look fresh! 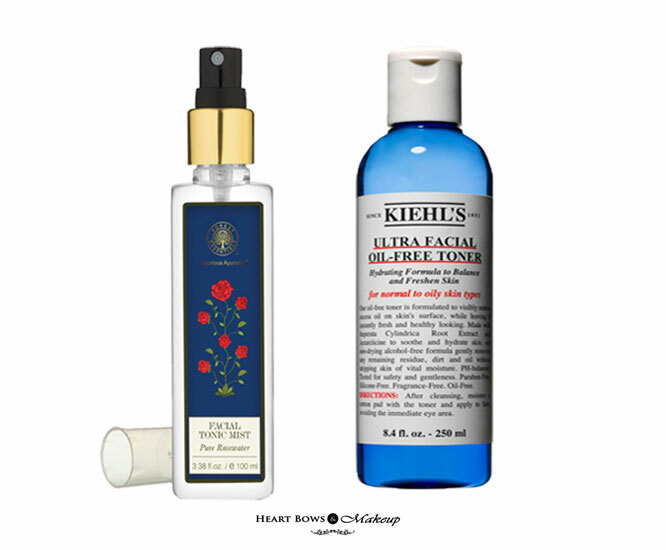 So those were the most effective and best toners for combination to oily and acne prone skin in India. Do let us know your favorites below. Top 10 Bollywood Plastic Surgeries Disasters: Before & After!